As the creative geniuses behind graphic novels continue to push the genre in unexpected, sometimes ill-advised directions—The Scratch-n-Sniff Stay-Puft Marshmallow Man Cookbook, anyone?—we’ve spotted a bit of a trend in the way serious, often hush-hush topics are getting the tickle treatment. Illustrated books showcasing the many shades of depression and bipolarism, for example, have become a thing, with the added bonus of shining light and lightheartedness into dark corners, helping to allay the stigma of shame. Needless to say, we admire the courage needed to poke a bit of fun at such weighty subjects and always look forward to what’s next. Enjoy the interview. What inspired Karma Police? Were either of you practicing Buddhists, or were you familiar with Buddhism from some other experience? Tony Gregory: I always found Buddhist iconography visually interesting, and through various points of my life, I’ve worked on mindfulness and practiced meditation, but I’ve personally never been a student of any religion or stepped foot in a Buddhist monastery. Chris Lewis: Tony is the only buddha I need! The book really came out of a desire to explore violence as a cyclical tragedy, and Buddhism, with its well-known—but probably sorely misunderstood by me—concepts of reincarnation and battling Buddhist assassins seemed like an interesting vehicle. There are several different types of Buddhism. Can you talk about which type you used as a backdrop for Karma Police, and how it differed or was more appropriate to the story than other types? Was there a clear line from which you had to deviate in order to tell a rousing, sometimes violent story? CL: Tibetan Buddhism was the biggest inspiration for Karma Police, as it incorporated the animism, old demons, and spirits that existed before Buddhism was able to start taking hold in that part of the world. Their tales of demon-slaying, court intrigue, and, yes, MURDER, are way crazier than anything in our book. One of our central questions—whether violence is ever justified—was emphatically answered in the 9th century by a Tibetan monk who decided to straight-up assassinate the king in order to stop his repression of the Buddha’s peaceful message. There’s actually a lot more literature than I ever expected about lamas getting stabby. Any specific books that stood out? CL: My main resources were The Buddhist Handbook by John Snelling, Magic and Mystery in Tibet by Alexandra David-Neel, and Foreign Devils on the Silk Road by Peter Hopkirk. The Journal of Buddhist Ethics is also quite interesting—and really complicated, as one would expect. Tony, there are a lot of distinctly Buddhist visual elements in Karma Police, including very specific items like the three-sided dagger that plays an important role in the book. Did this graphic novel require a lot of visual research? How did you go about it? How did you coordinate that research with a third party, Jasen Smith, who did the coloring? TG: Chris and I talked about the visuals over and over again, sending each other references for monsters, creatures, set pieces, etc. Once we nailed down a look, I went about designing the world. During production my studio was covered in photos and drawings of monks, temples, “foo dogs,” and much, much, more. 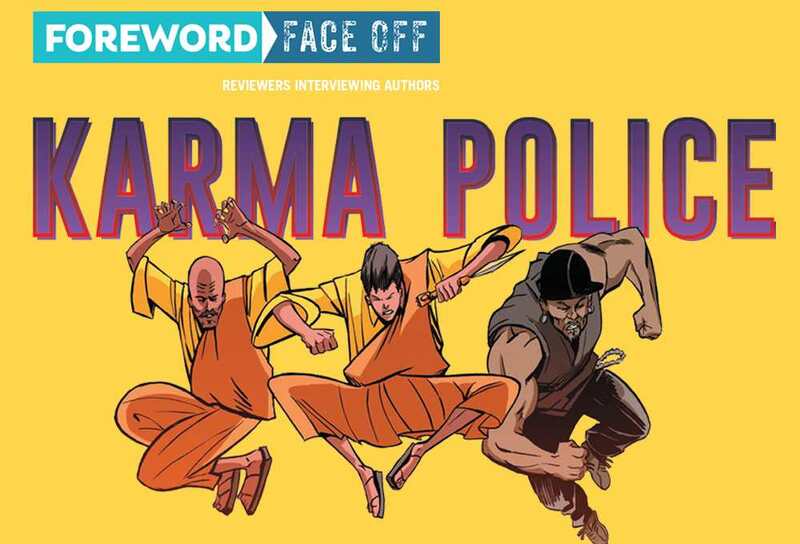 Creating the Karma Police world was some of the most fun I’ve had in comics! One of the strengths of Karma Police is that it’s immediately recognizable as having a strong Buddhist influence, but there’s also a lot of of playful interpretation and off-the-wall imagination at work—an example being a villain who’s obsessed with luchadors (masked Mexican wrestlers) and can actually create and manipulate them. Was it difficult to balance those two aspects? Was there anything that you first included in the script, but later rethought as having gone too far one way or the other? TG: I tried to keep a balance visually, and I’m glad you noticed that! We wanted to be respectful of the religion but not get hamstrung creatively. Like I said, I’m not a practicing Buddhist, so I tried to keep that in mind and went about the research with intent. It wasn’t hard to keep it fun and wild, Chris’s script embodied those themes. For example, he wrote El Muneco (the villain you mentioned) as a small man with a luchador mask, who lives in a birdcage! But he also did his research when dealing with religious elements, like the warriors in the beginning of issue 3, who were based upon designs that are prevalent in Buddhism. CL: That’s a really good question. The spark of the story is for sure rooted in Buddhism, but we wanted to explore themes that resonate with everybody. Like luchadors. Rather than run the risk of diving too deep into the myriad complexities of a religion we don’t practice, we decided to let our imaginations run wild and have some fun while looking at some serious topics. Was Karma Police a one-time project, or do you have other stories in mind for its world and characters? TG: I’d never say no to more Karma Police and would jump at the chance to work with Chris again! CL: Karma Police stretches across centuries and generations. We have many more stories to tell! 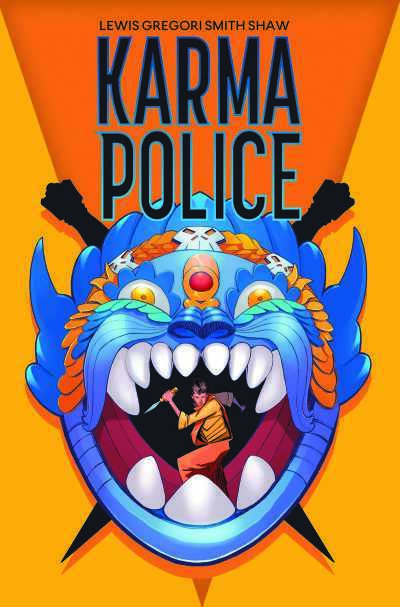 Karma Police existed as a digital comic before Vault Comics collected it in print, and it reads well either way. Do you personally have a preference for print comics or digital, and if so, why? CL: I’m a print guy, myself, but whatever floats your boat. The book’s title as it relates to the Radiohead song “Karma Police”—inspired by, knowing wink/nod at, or pure coincidence? TG: Radiohead is one of my favorite bands, so when Chris approached me with the idea years ago, he pretty much had me from the time he told me the title. CL: Music plays a big role in my creative process. Sometimes all it takes is a good song title to spark an idea. If we ever get the chance to do a second volume, it will most likely be called Karma Police 2: The Karma Chameleon. You down, Tony?